I’ve never followed Death Angel until this year. I know Act III is supposed to be their masterpiece and one of the better thrash albums out there but it wasn’t until this year that I finally picked it up. I’m very picky with my thrash. A lot of thrash bands sound like garbage to me. I like thrash but it’s not my favorite sub-genre of metal. And I have zero interest in any thrash band that pushes themselves towards any type of “extreme metal” sound. So it often takes me a while to come around and try thrash bands I haven’t heard before. The good news is that I’m enjoying Death Angel very much. I’ve had Act III since earlier in the year but I haven’t gotten around to reviewing it or listening to it a whole lot but I’m really liking Relentless Retribution. It’s a great balance of aggressive and melodic moments. There are pure thrashers like “Truce”, “River Of Rapture”, “Into The Arms of Righteous Anger” but then songs like “Relentless Revolution”, “Claws In So Deep”, “Volcanic” and “I Chose The Sky” throw in enough melodic moments to keep the album interesting. Not that the full-throttle headbanging numbers are anything to sneeze at. There are some excellent moments all throughout this album and of the few recent thrash albums I’ve heard over the last two years or so, Relentless Retribution has proven to be my favorite so far. 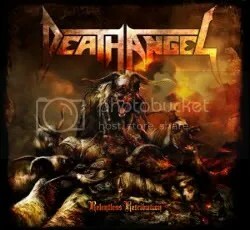 I’ve heard some minor quibbles from longtime Death Angel fans that the album carries too much of a modern metal vibe. I’m not sure how true that it is but so what, I found myself enjoying this disc.